Detroit, Mich. (26 July 2018) – The New Economy Initiative is launching a new talent development program, the Detroit Innovation Fellowship (DIF), that is designed to promote and invest in social entrepreneurs and innovators who are leading projects to strengthen neighborhoods in Detroit, Hamtramck, and Highland Park. Twelve social entrepreneurs representing nine projects have been selected to participate in the inaugural DIF cohort. The 2018 DIF fellows will each receive a stipend award ($10,000 per project) and yearlong access to a suite of professional development and mentoring opportunities. They will also convene quarterly to discuss challenges related to their work and opportunities for collaboration. The Urban Consulate, a national facilitator of conversations about making cities better, will serve as NEI’s partner in coordinating DIF cohort convenings and professional development opportunities. Rebecca “Bucky” Willis, founder and director of Bleeding Heart Design, which is using human-centered design, architecture, and public art to rebuild Northeast Detroit’s Lindale Gardens neighborhood. Learn about each of the 2018 DIF fellows at DetroitInnovation.org. Photos of the winning 2018 fellows are available here. DIF is another step in NEI’s increasing focus on building greater networks of social innovation at the neighborhood level. 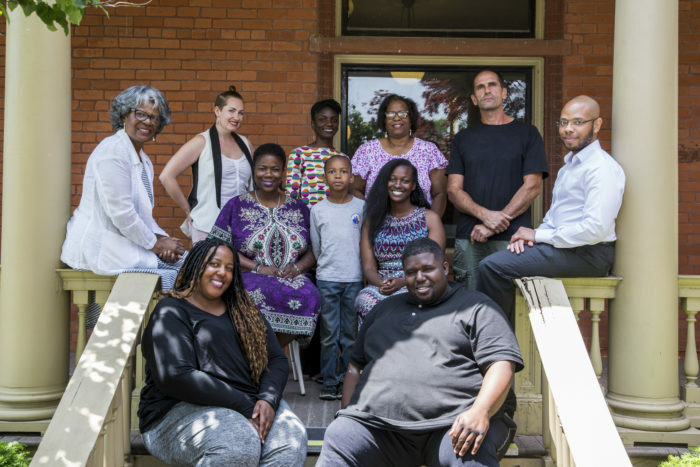 NEI identified its 2018 DIF fellows through a process that involved quarterly community listening sessions co-hosted by Issue Media Group, publisher of Model D. Listening sessions were held in neighborhoods across Detroit, Hamtramck, and Highland Park, and engaged residents were invited to share stories of “homegrown innovation” taking place in their communities. Having learned about dozens of people leading projects to improve the health, safety, and economic vitality of their neighborhoods, NEI invited 12 people to participate in DIF whose projects were established, met a community-specified need, showed a track record of community engagement and collaboration, and addressed community challenges in novel ways. The yearlong Detroit Innovation Fellowship cohort will run through May 2019. The New Economy Initiative (NEI) is a special project of the Community Foundation for Southeast Michigan that’s working to build a regional network of support for entrepreneurs and small businesses. Its mission is to grow an inclusive culture of entrepreneurship in southeast Michigan that benefits all residents and strengthens the regional economy. Since 2007, 13 foundations have contributed a total of $159 million in support of NEI’s work with entrepreneurs and community innovators. Learn more at http://neweconomyinitiative.org/. A winner of the Knight Cities Challenge, the Urban Consulate launched in 2016 as a network of parlors for urban exchange. Since then, Urban Consulate has hosted more than 150 conversations in Detroit, Philadelphia, and New Orleans to bring people together and share ideas for better cities. Learn more at http://www.urbanconsulate.com/.